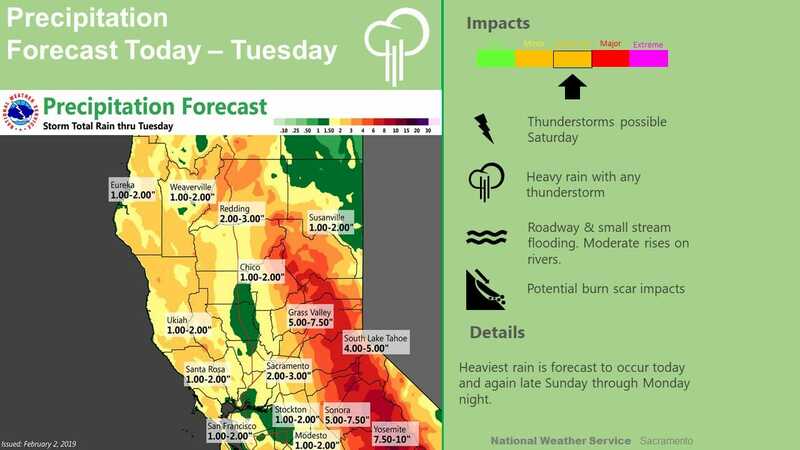 February 2, 2019 – Series of Pacific storms will impact Northern California through Tuesday. Periods of moderate to heavy precipitation with gusty wind and isolated thunderstorms are expected. Drier weather returns by midweek. Vertically stacked extra-tropical cyclone centered about 230 nm west of KUKI this morning with deepening 981 mb surface low. Associated frontal system is pushing inland producing widespread precipitation. Strong southeasterly wind developed in the Central Valley overnight, ahead of the front, from about the Sacramento area south, with some stations reaching low end wind advisory criteria. Wind speeds expected to decrease with frontal passage by late morning. Higher resolution models indicating heaviest precip this morning as baroclinic zone moves through. 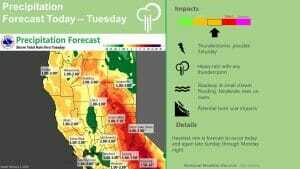 Will need to monitor rain rates over recent burn scars for mud/debris flow potential. Snow levels are currently around 6000 to 6500 feet. Heavy snow is occurring in the Sierra Nevada where chain controls are in effect. Precip turns showery behind front by this afternoon. Model CAPE increases to about 500 J/kg in portions of the Central Valley and Motherlode this afternoon suggesting potential for thunderstorms. 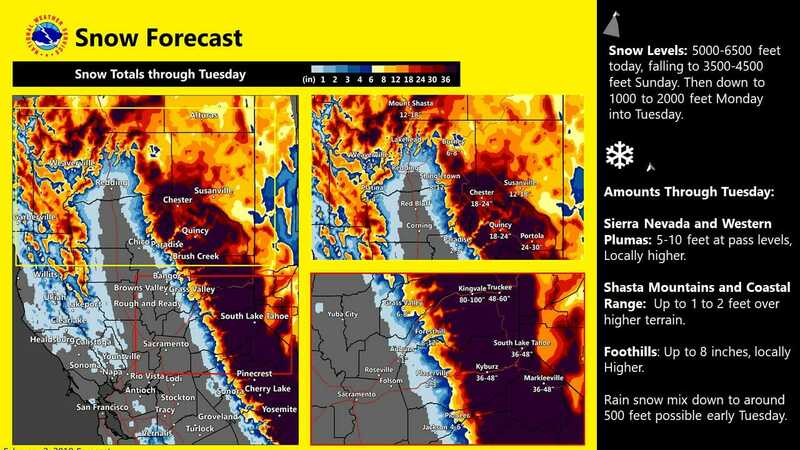 Snow levels lower to around 5000 to 5500 this afternoon. Decreasing showers tonight as low center tracks through Central CA and fills. Weak ridging follows Sunday morning with mountain showers continuing and snow levels around 4000 to 5000 feet. Scattered showers or isolated thunderstorms possible in the Central Valley Sunday with best chances during the afternoon when instability peaks. Snow increases in the Sierra Nevada Sunday night as moist 7h southwest flow increases to 65 kts ahead of next shortwave trough. System tracks through Sunday night with lower elevation showers and moderate to heavy snow in the Sierra Nevada. Additional shot of colder air drops snow levels down to 3000 to 4000 feet. 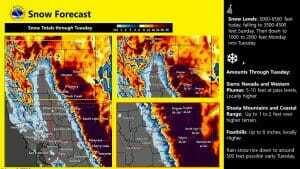 Deep colder storm system from B.C. then digs along the West Coast Monday, moving inland over Central CA Tuesday. This will result in additional precipitation for CWA with heavy mountain snow. Snow levels will lower into the foothills Monday and possibly some rain/snow mix in portions of the Northern Sac Valley Tuesday morning. 5 to 10 feet of new snow is expected in the Sierra Nevada through Tuesday with local amounts up to 13 feet possible over the highest terrain. Amplified upper air pattern forecast to continue later next week. Dry weather behind the exiting early week system has the potential for bringing freezing temperatures to the Central Valley Wednesday and Thursday mornings with coldest portions of the valley dipping down into the mid to upper 20s. Another system is forecast to drop down from the north late in the week bringing another round of low elevation snow, but likely ending the freeze threat for the Central Valley.